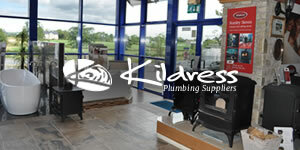 Kildress Plumbing Suppliers are a family business who have been perfecting family homes since 1978. From humble beginnings our showroom now represents the largest bathroom, tile, multi-fuel stove and range cooker display in Northern Ireland, featuring more than 60 bathroom suites, a comprehensive display of multi-fuel stoves and range cookers, and a magnificent range of shower enclosures and equipment. Alongside the many working model ranges, baths and showers on display, is an array of tiles and accessories to compliment all our products. In fact we have recently introduced fireplaces and hearths to our showroom to offer our customers even more choice. You can rest assure, therefore, that when it comes to bathrooms and range cookers, we have a wealth of experience, which we have applied to providing the very best for our customers in terms of quality, choice and price. Our company has been built around the core beliefs of quality products, innovative displays, competitive prices, extensive product knowledge and commitment to customer service. We would hope that our showroom is the prime example of those core beliefs in action. We are premier dealers for quality brands such as Laufen, Lefroy Brooks, Roca, Hansgrohe, Jacuzzi, Morso, Charnwood, Rayburn, Stanley, Heritage Bathrooms and tiles from Arcana and Unicom Starker.